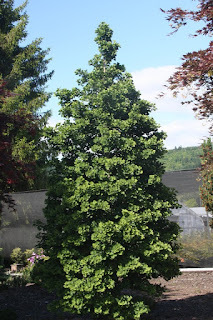 In the previous Flora Wonder Blog, Arrivals and Departures, I mentioned that I occasionally sell my largest of a certain species, or the absolute last of one, or even the first or the original of a certain tree. For example, the original Acer palmatum 'Fairy Hair' was sold and shipped to New Jersey. The original Acer palmatum 'Sister Ghost' was sold and shipped to Washington state, even though the scoundrels at Garden of Eden Nursery in Puyallup, Washington never did pay for it. Today's blog will discuss some of the originals – those plants introduced by Buchholz Nursery that still remain. 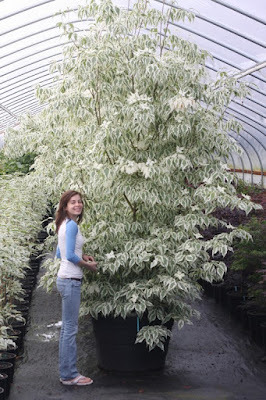 Every tree has its price of course, and so does the entire nursery for that matter; and who knows: maybe some of the following will be sold before I even finish this blog, and perhaps by week's end someone else will own the company. 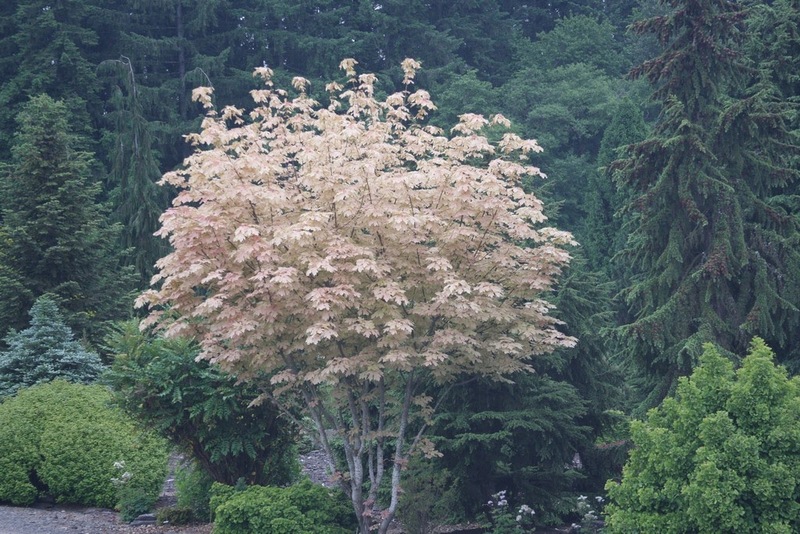 The original Acer palmatum 'Purple Ghost' is still growing in the Display Garden. 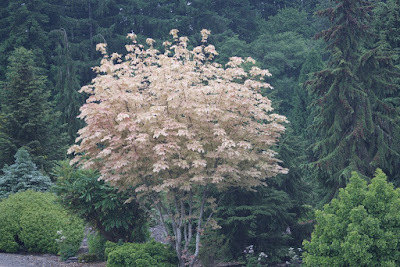 It became the cultivar that has sold the most from our “Ghost Series,” and apparently thousands of them are now in American and European gardens. It originated as a seedling from A.p. 'Kasagi yama' and is superior to it in all respects. 'Purple Ghost' was selected about 1990, and in 1996 the 6-year seedling was planted out using the code name 'Kasag DG 96', and we even sold some under that code name. I don't do that anymore, rather I now supply the final name to any seedling selection if I give one away or sell it, and that policy saves a lot of confusion later. An example would be my introduction of Acer palmatum 'V. 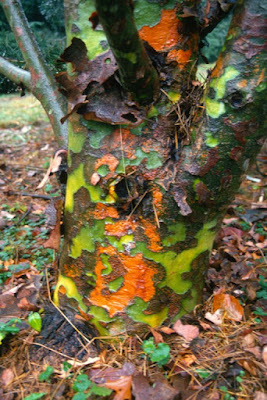 Corbin', where the “cultivar” name is a code name only. 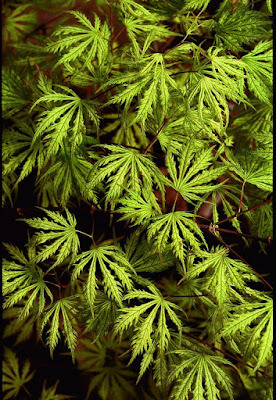 Unfortunately it is listed in the Vertrees Japanese Maples (3rd edition 2001) thusly. By the 4th edition 2009, it is listed by its final name of 'Midori no teiboku' – meaning “green and spreading.” The world of horticulture didn't need to go through the extra trouble that I caused. 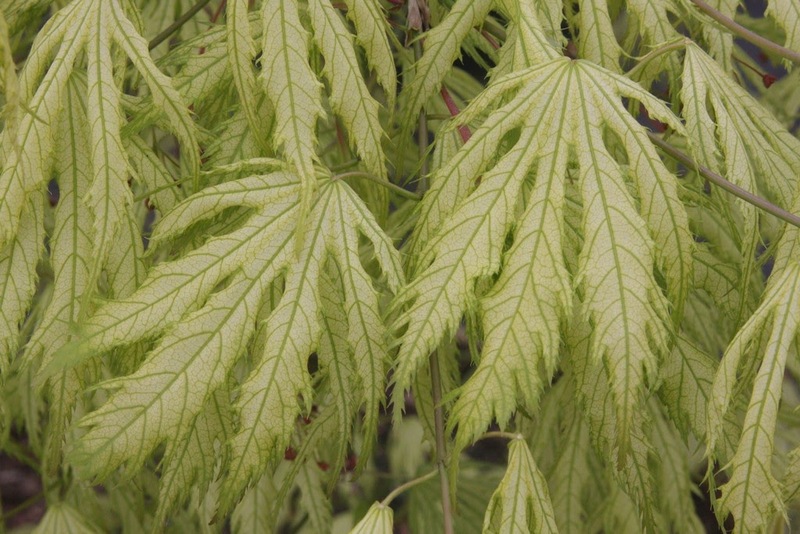 The original Acer palmatum 'Ikandi' is still in a container in GH19, and I must confess that as it continues to grow it becomes more difficult to squeeze past. 'Ikandi' originated as a seedling of 'Alpenweiss' but the former is much more colorful, especially if you like bright pink spring foliage. We began to sell 'Ikandi' about five years ago and initially some concern arose that our younger sizes did not display the same color as the photos portrayed on our website. That is to be expected, and discerning maple hobbyists and maple professionals know that young plants produced in a greenhouse with lots of heat, water and fertilizer do not usually display the colorful characteristics that the cultivar was selected for...but that eventually when given “real-world” care, the colors will show up. 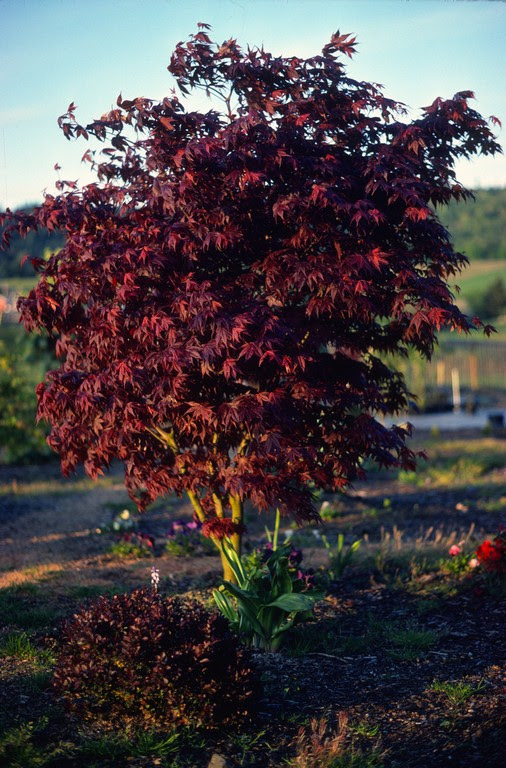 Our advice to any worried growers is to calm down, be patient, and probably by the following spring you will be thrilled that you purchased our trees. In the past few years I have planted 'Ikandi' in a couple of locations at our Flora Farm, as well as in some gardens at the nursery. How many we produce each year depends upon these results. 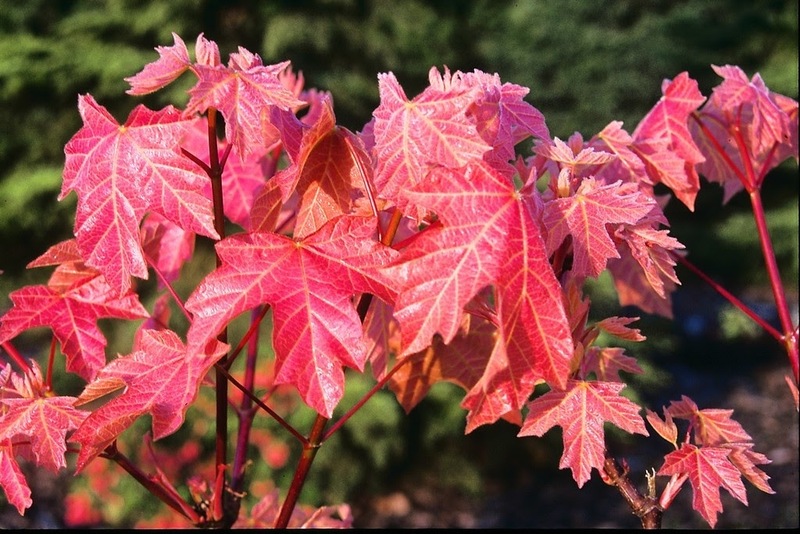 Do we have a fantastic “doer” that will enliven Western gardens, or do we have a wimpy cultivar that needs to be coddled in a container that is suitable only for maple aficionados with over-wintering facilities? 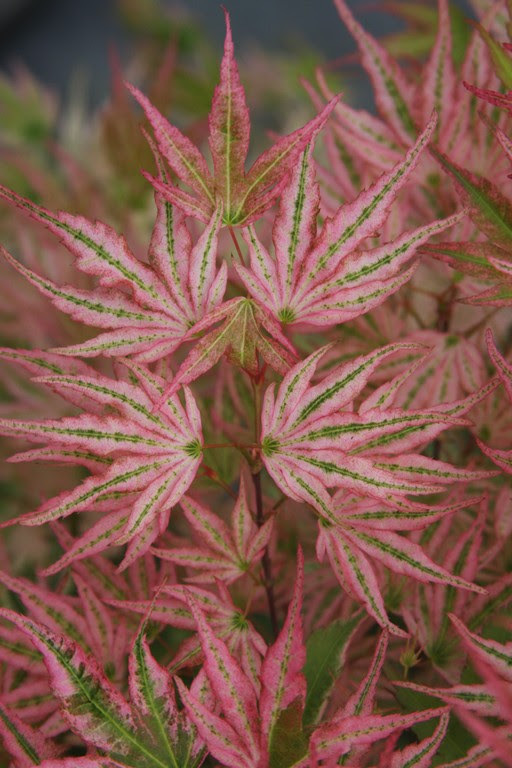 Early trials at Buchholz Nursery suggest that horticulture has been blessed with our discovery of 'Ikandi'...and I promise that anyone ordering from our one-gallon maple program will receive at least one, as I promised earlier for Acer palmatum 'Peve Starfish'. 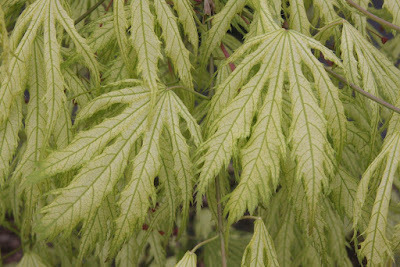 Acer macrophyllum 'Mocha Rose' resides in the nursery's Blue Forest, a garden that originally contained only blue-foliaged plants. Of course there is nothing blue at all about 'Mocha Rose', and for the past 20 years we have incorporated other foliage colors into the forest as well. 'Mocha Rose' was introduced about 2000 and the original seedling appears to grow at about one quarter the rate of the type. 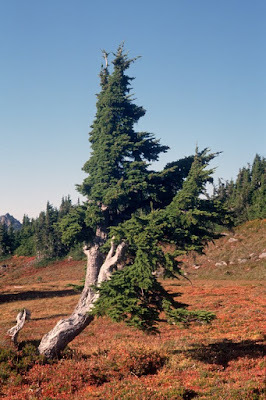 Nevertheless it is vigorous and without pruning it would eventually compromise my nearby “mountain hemlocks,” Tsuga mertensiana, which are over 50 years old. None of the parties involved can be dug and moved – at least not without great risk and expense. I value the hemlocks no less than the macrophyllum, so for now I must continue to prune. Too bad 'Mocha' wasn't planted on a large estate lawn, but then I've never owned a large estate. When I say that it grows at one quarter the rate as the type, I am referring to the original seedling. Any propagules – grafted onto vigorous green macrophyllum rootstock – will likely speed up the rate of growth. We'll never sell a large amount of 'Mocha Rose' because 1) it grows too large for most landscapes and 2) it is only hardy to USDA zone 6, or minus ten degrees. 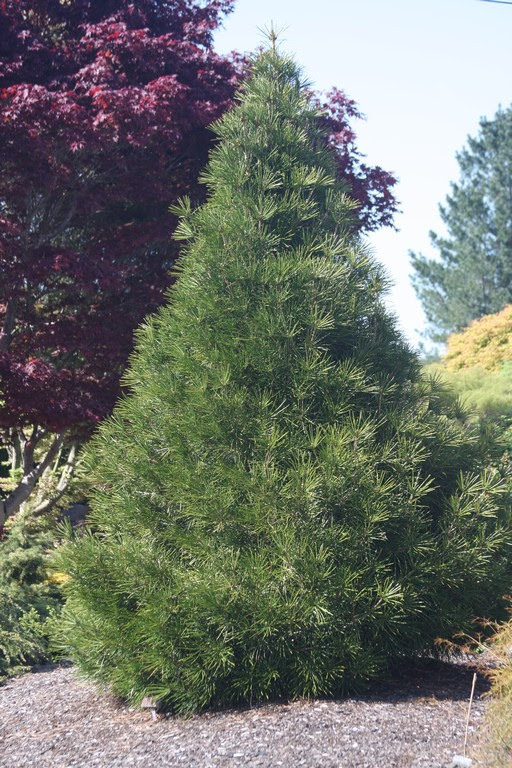 We selected a chubby “Umbrella pine” seedling about 25 years ago and named it Sciadopitys verticillata 'Fatso'. 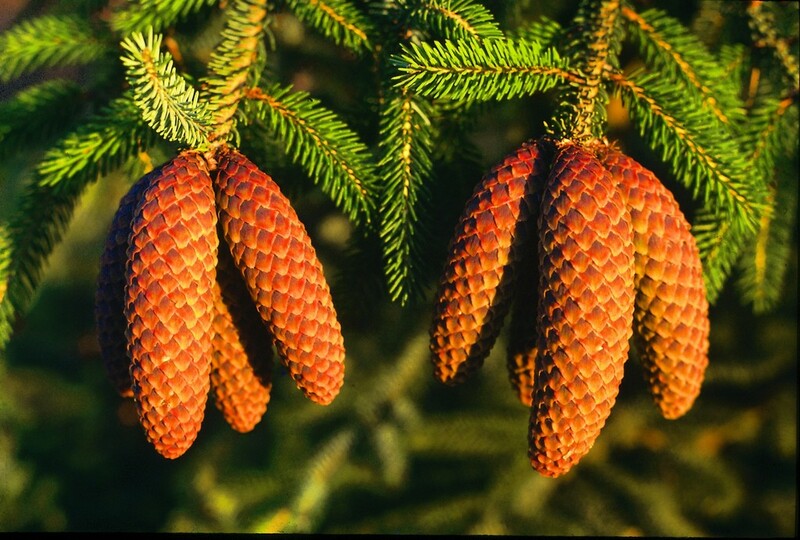 At about 12 years of age it was planted into a cedar box and placed along the main road into the nursery. There, it drew a lot of attention and it seemed as if every customer wanted to buy it. To solve that problem we planted it next to the office where I can appreciate it daily. However I have now concluded that it is not worthy of cultivar status, and I regret that we propagated and sold some 'Fatso' offspring. We never did root 'Fatso' from cuttings, but we did graft some for two consecutive years and then grew them on in containers. These grew at the same rate as the type so 'Fatso' wasn't so fat anymore, and there wasn't any point to continue to produce it. 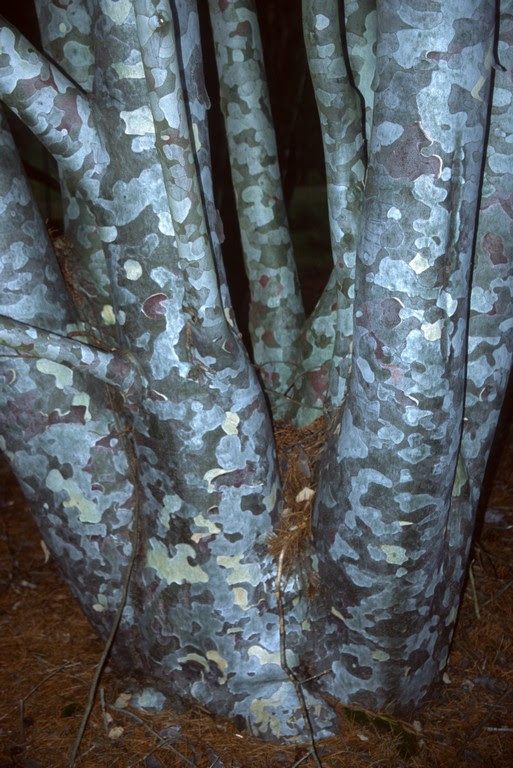 Furthermore, the original seedling has gained purchase in the garden and every year it appears more and more normal, like any other Sciadopitys, so you could conclude that it is not deserving of a cultivar name. Another forgettable moment at Buchholz Nursery. 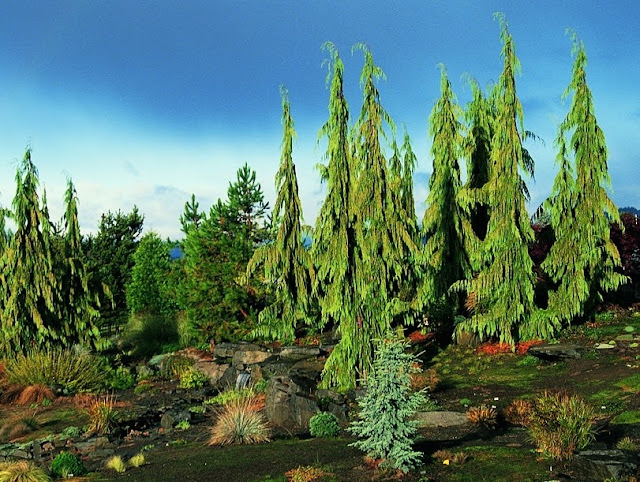 We have a few Chamaecyparis nootkatensis 'Green Arrow' in the Blue Forest which are the first propagules ever of the tree discovered by the late Canadian Gordon Bentham on Vancouver Island. 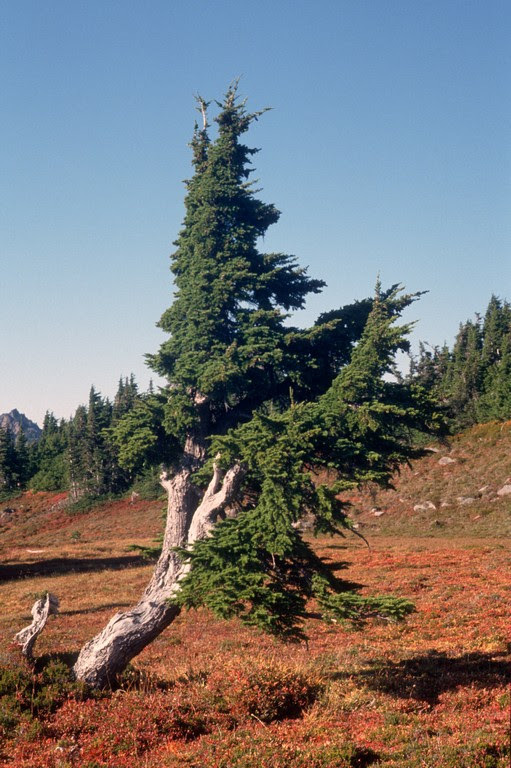 I've told the story before, but in short I rescued the two-year grafts from a bankrupt Victoria nursery and brought them to the USA, and if I had not heard the story about the tree – growing on Canadian government forestry property – from Bentham shortly before he died, the cultivar would certainly have been lost to horticulture. 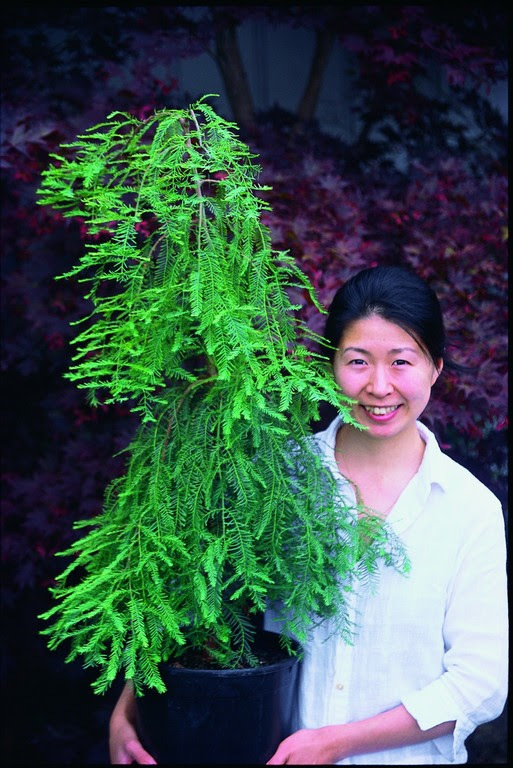 Now they are grown by the thousands, and whether produced by rooted cuttings or by grafting onto Thuja orientalis rootstock, their value has declined due to the abundance. Nevertheless it is an excellent garden plant, and more than one catalog describes it by copying the phrase that I coined: “'Green Arrow' provides a fantastic exclamation point in the landscape.” In spite of its name, the foliage of 'Green Arrow' would more accurately be described as gray-blue, and a rival cultivar, 'Van den Akker', displays foliage more green. One of the original 'Green Arrows' was dug when it was about 18' tall and it was planted into a large cedar box. We gave it a year to recover and then it was put up for sale and it was snapped up in short order. I flagged it as sold in the summer and it was to be shipped the following spring. 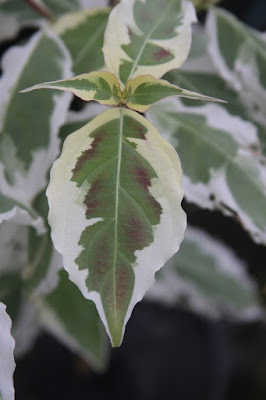 When flagging I noticed one 8” shoot with variegated foliage. I watched it for months until it was time to graft, then the one scion was snipped off for better or for worse. 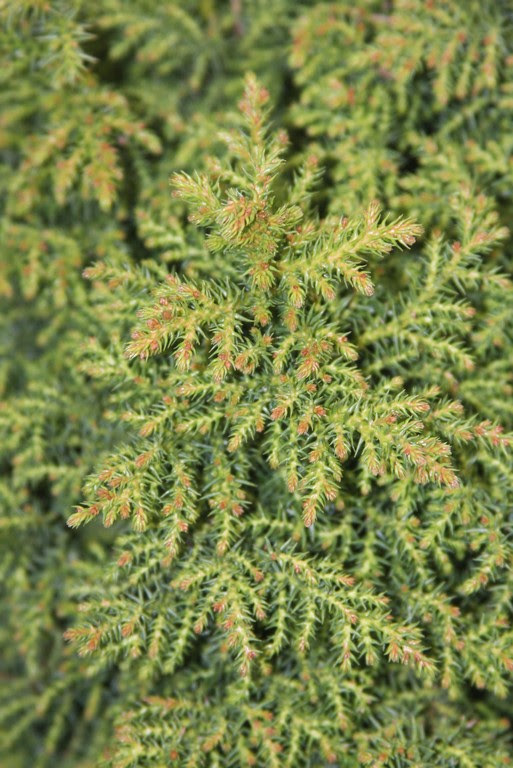 Thankfully it took, and thus Chamaecyparis nootkatensis 'Sparkling Arrow' was born. It took many years to build up our stock as I was determined to propagate with only vigorous terminal shoots so that the cultivar would retain its narrow form. 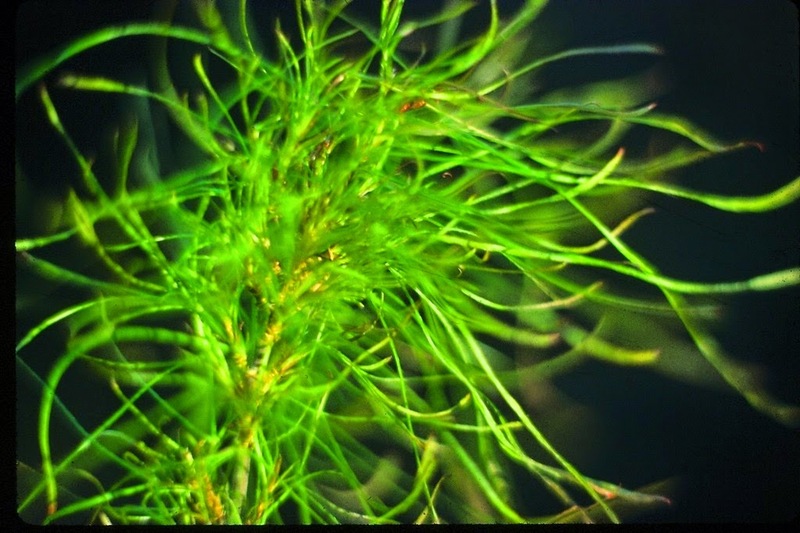 Now that 'Sparkling Arrow' is in the hands of other growers I know for a fact that some are grafting with any piece of wood that they can get, and that might compromise the cultivar's standing as a narrow conifer. 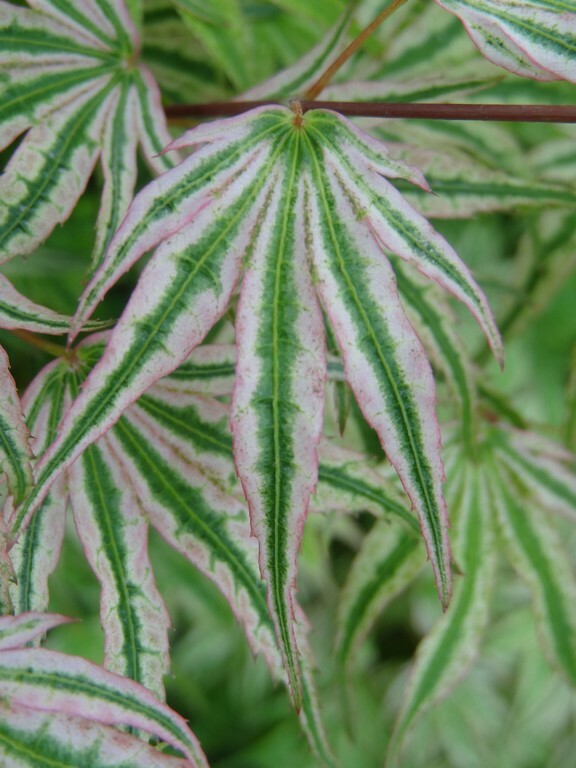 In any case 'Sparkling Arrow' is much less prone to reversion than the old cultivar 'Variegata' which should be banned from horticulture altogether. The original Cornus kousa 'Summer Fun' is growing in our Atlantic Garden and I can see it out the window from my chair in the office. I am not tempted to sell it – though I would for the right price – because the original is no longer the largest. One of greater size, in fact, is growing in front of my children's play house at the edge of the front lawn. When I mentioned at the dinner table that we might dig it and put it up for sale my wife and kids simultaneously cried out “Nooooo - How dare you!” I calmly responded that it would fetch at least $500. My 14-year-old gave me an incredulous look, “Really?” She doesn't fully comprehend how her father can plant a tree for fun, and then cash in on it for a great sum later, but then I don't get her teenage world either. I bristled a few years ago when a nationally known plant personality suggested that 'Summer Fun' certainly must be my career “legacy.” I though that short-changed me, and I rather believe that if I have any legacy at all it's that I am hard-working and honest and that my jokes are among the world's most funny. For what it's worth, I think that 'Summer Fun' is my only plant introduction that made it into the Hillier Manual of Trees and Shrubs (2014), but that just shows you how insular and behind-the-times British horticulture is. 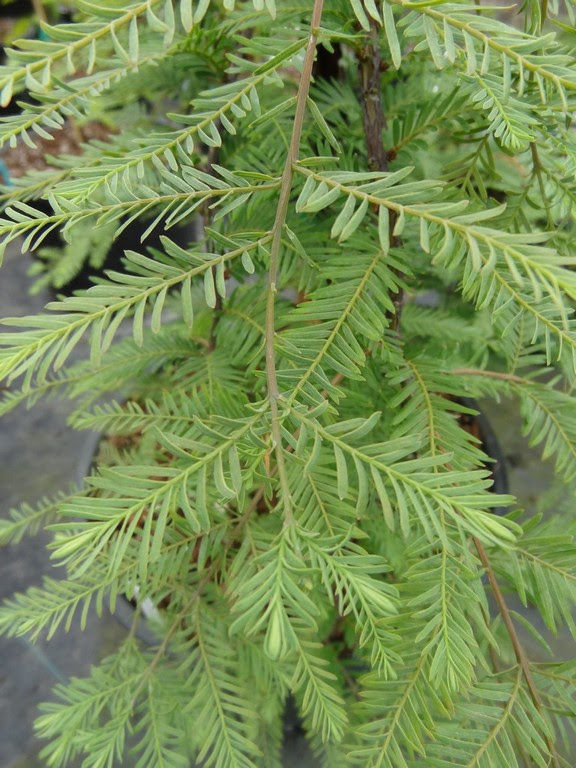 If I did have a genuine plant legacy why wouldn't it be for introducing Metasequoia glyptostroboides 'Miss Grace'? 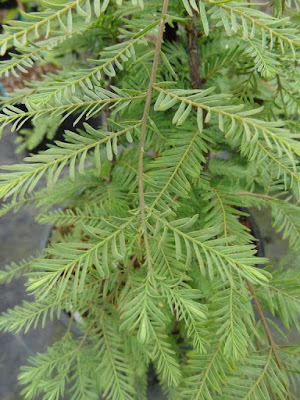 Scions were sent to me about 20 years ago from a “prostrate witch's broom” found on a “Dawn redwood” from New York. Big deal; I didn't initially imagine that such a thing would have any horticultural merit. A deciduous conifer – dead for half the year – creeping along the ground – who wants that in their garden? Anyway we started with six scions and all took. A year later they were all in 1-gallon pots labeled 'Prostrate WB'. One day my back was turned and the crew had them staked up. That irked me, but I had to accept that the rank and file at Buchholz Nursery have no clue what “prostrate” means – isn't that some problem that old men get? I made a mental note to de-stake them but I never got around to it. They formed neat little weeping trees, and I grew to like them that way, and in fact today we stake up 95% of our 'Miss Grace'. The photo with my wife is with one of the original six grafts, and later that fall it was planted out (photo above), and it might be the largest that exists in the world. I just checked the Hillier Manual and to my surprise 'Miss Grace' is listed, and it's described as “A small, elegant cultivar...” I never sent any to England myself and I think that Dutchman Nelis Kools was the first to get it from me and then he distributed it throughout Europe. 'Miss Grace' is not completely unique to the plant world, for there exists a near look-alike in Metasequoia glyptostroboides 'Bonsai'. If you place a group of one next to a group of the other you can detect a slight difference, but for me they grow at the same rate. 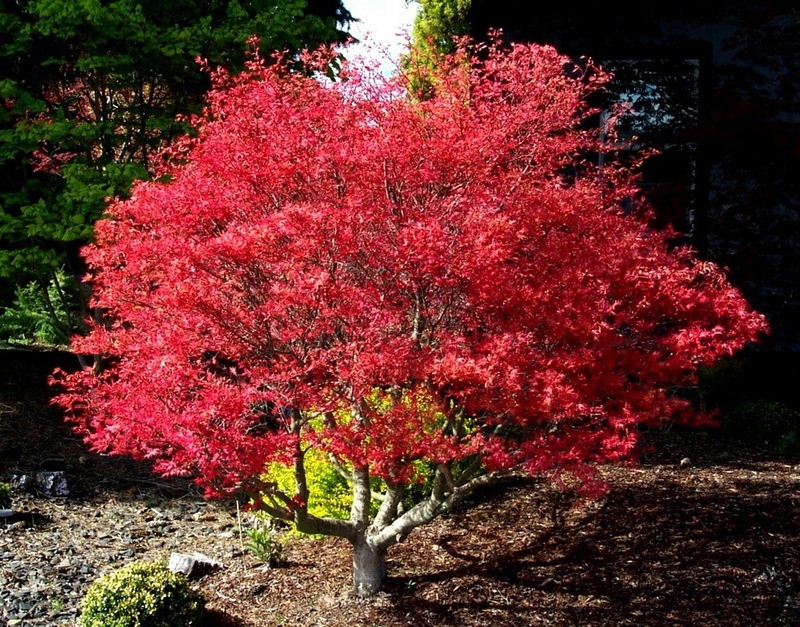 Interestingly 'Bonsai' originated as a seedling as opposed to 'Miss Grace' originating as a witch's broom. 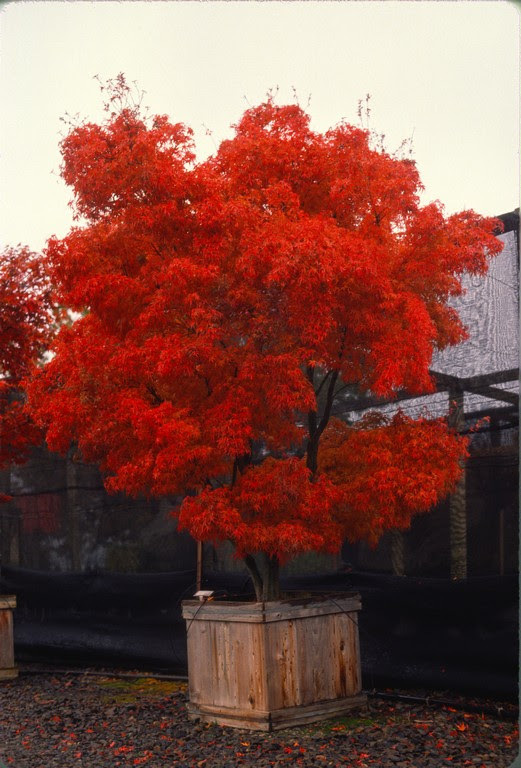 The original 'Bonsai' is now growing at the Morris Arboretum in Philadelphia, and it was gifted to them by the late John Kuser. 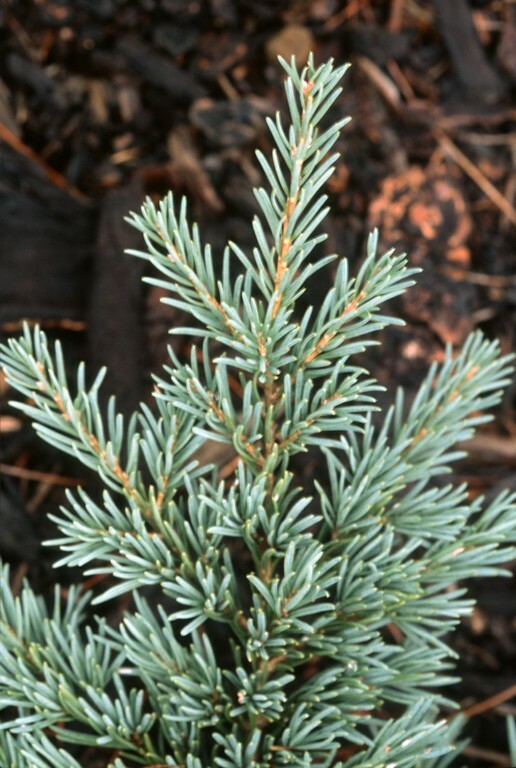 The late Dr. Bump discovered an unusually blue “Mountain hemlock” on the flanks of Mt. Hood, Oregon. Not only did he discover it, he dug it up and transplanted it into his garden, and I would guess that would have been sometime in the 1960's. Who knows how old it was when he stole it from nature? Don't hold it against Dr. Bump for his eco-theft because back then it was normal for a male doctor – a group of men who are often fascinated with plants – to dig up a tree from the wild. The seedling was about 30 years old when I first encountered it, and besides the shining blue foliage I was impressed with its narrow habit. Dr. Bump was delighted when I requested scionwood, and perhaps he took it as a confirmation that he possessed a good eye for plants. It was named 'Bump's Blue' and the photo above was the first graft from his tree which is now over 30 years old. I can sell 'Bump's Blue' easily at any size, but they are so slow-growing that I'm certain that I don't make a profit at all. Some seed sources for Tsuga mertensiana can produce a crop of trees with pretty good blue foliage, but I find them nearly impossible to sell. That's odd because my last crop of garden-worthy 12-year-old trees was priced at only $70.00 and it took forever to get rid of them. About 20 years ago I visited the late Edsal Wood at his Bonsai Village Nursery. 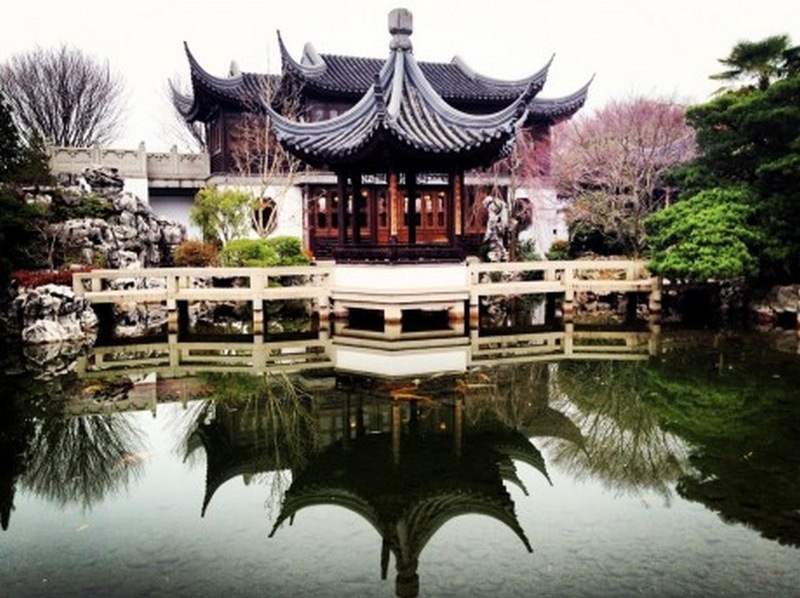 He grew thousands of pre-bonsai seedlings and also thousands of seedlings that were never intended for bonsai. 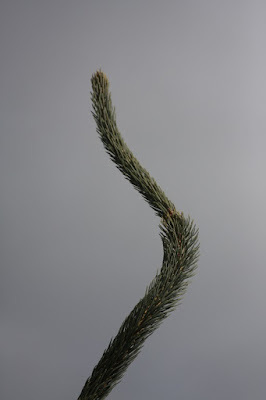 He invited me to his Aurora, Oregon nursery to show off a tiny Pinus mugo seedling with extremely short, curved blue needles. It was only one inch tall at two years of age, and honestly I thought that he was mistaken, that it was really a Pinus parviflora, not mugo. I said something like, "That sure is worth watching," and he responded, "Then you watch it," and he shoved the pot into my chest. 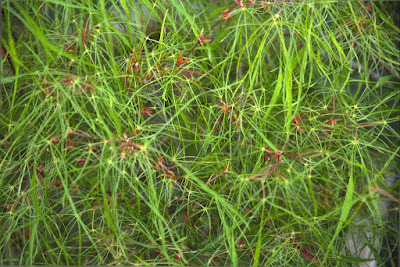 When I got home I carefully picked off a fascicle to count the needles and found only two – not five like a P. parviflora would have. 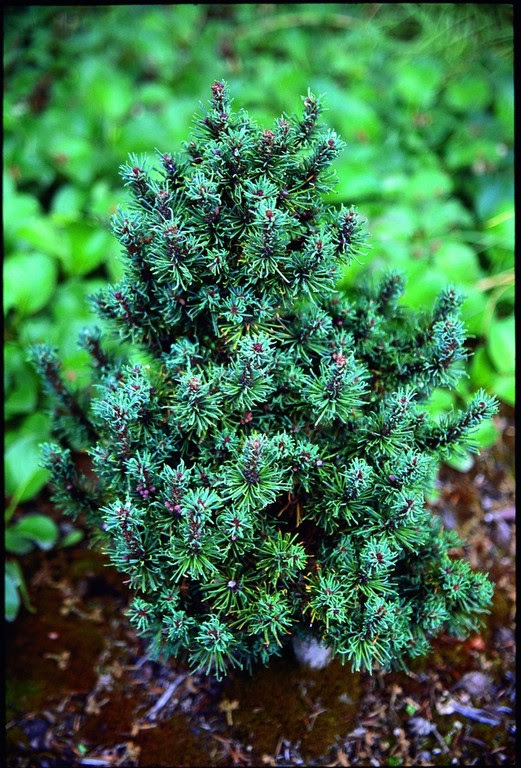 So, a miniature blue mugo pine, unlike anything I had ever seen before. To keep track of it I had to name it something, and for some reason I chose 'Mr. Wood' even though I preach against naming plants for people. 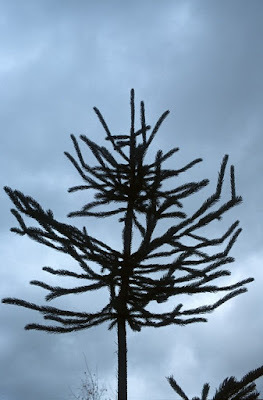 A decade ago European conifer collectors descended upon my nursery, as word was out that Buchholz had a miniature blue mugo, and I used 'Mr. Wood' without shame to barter for some of their choice cultivars. Now I keep it as a novelty, grafting a few now and then, but I'll never make any money off of it because it takes about eight years to fill a one-gallon pot...to sell for just $16? The original 'Mr. Wood' was dug from the garden three years ago because it was in too much shade and too close to another plant. It is absolutely not for sale, not at any price...unless you buy the entire nursery. It's not that I express a ruthless capitalistic bent, but it's true that I will occasionally peddle a tree for profit when my heart cries out to not do so. 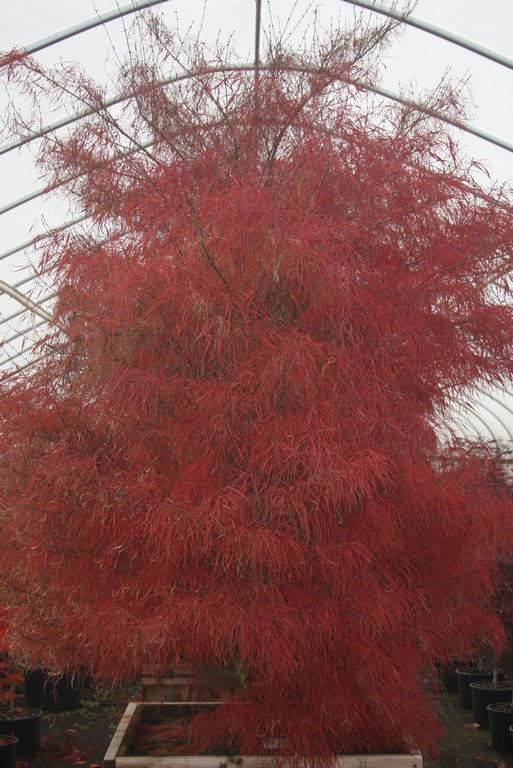 The largest of this, the first or original of that, the last one of something else... they have appeared on the Buchholz Nursery sales list and I try to not wince once one is loaded onto the truck and the back doors are closed. 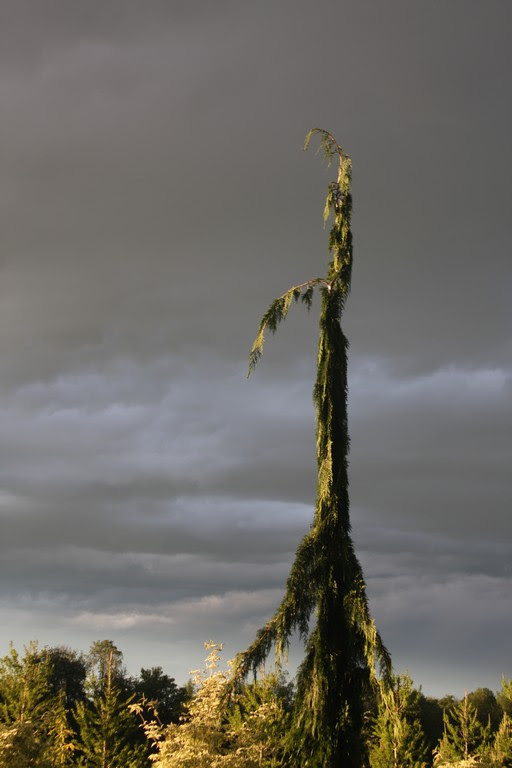 The tree goes off to someone else, and like with a child leaving home I must adjust to the situation and adapt to the absence that its departure creates. I don't know about the two Italians off to the sea, but I've always had at least one sock missing. Still, I don't let the selling-off of my arbor assets paralyze me. Once an office employee lamented when I announced that x company had just purchased a favorite tree, “Oh, how could you sell that? I just love it.” I responded with, “Me too, but I sold it to finance your next payroll check,” and I probably displayed a sardonic smirk on my face with the explanation. The tree in question was an Acer palmatum 'Corallinum' specimen planted just south of the office, and I got a couple thousand dollars for it. I'm now glad that it's gone, especially since it was planted too close to the road and the nearby parking lot. It was always a source of tension for me, because knucklehead delivery drivers, or my own employees even, might have backed a truck into it and smashed it to smithereens – such has occurred elsewhere on the property! In any case I still sort of possess it – at least digitally – and at least my photographic memory remains safe from delivery trucks. How could anyone separate himself from the sage characters depicted above? These three “Weeping Giant Redwoods” graced the very eastern border of the nursery – the Beyond Section – along with about 20 others, and as anyone who has ever grown them knows: no two look alike. 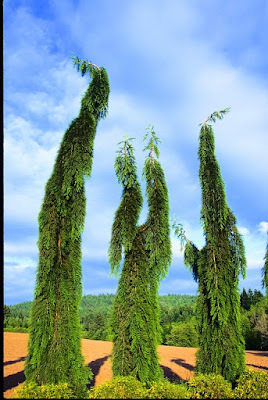 But this group of three seemed to possess a spirit that went beyond that of normal plant life. 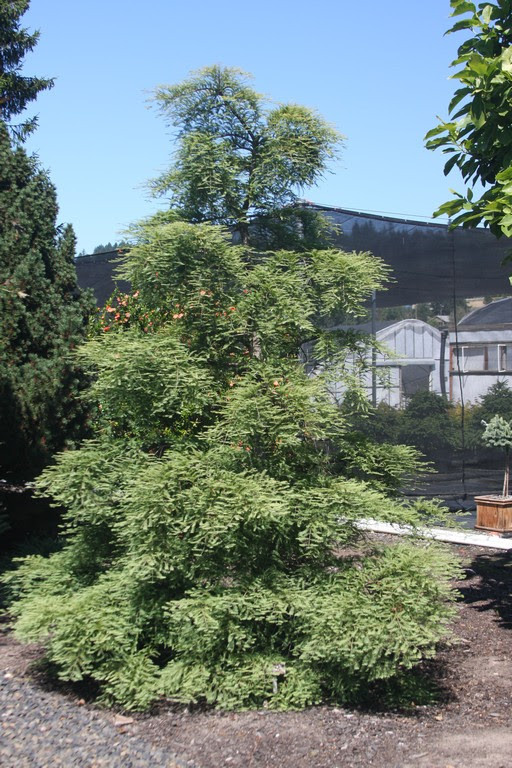 When the “hedge” reached 15-20' tall, an Oregon re-wholesale nursery proposed to buy the lot, which would include their labor to dig, and with no required guarantee on my part that the plants would survive. My three friends had begun to change after the year of the photograph anyway, and new growth made them different, like they had no connection with each other any more. Their spirit had departed and they became mere trees to harvest, and surely I needed all of the cash I could get. It took two days for their removal, which also included the company filling in the craters. I stayed away the entire time, then sauntered out alone to inspect the grounds the following Sunday. The buyers had performed as promised, short of one broken water valve that we had to repair, but I was left feeling empty, like I hadn't given my old friends enough time to regroup or to form other connections with each other...to regain their spirit. 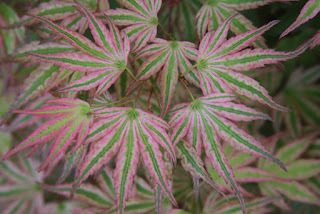 Acer palmatum 'Bloodgood' made its appearance in Oregon nurseries in the mid-to-late 1970's, and although no one knows for certain the cultivar's origin, Vertrees in Japanese Maples suggests that “it appears to have been cultivated in the United States since well before World War II.” In any case it quickly became popular and is now the standard by which other similar cultivars are compared. Catchy name too. 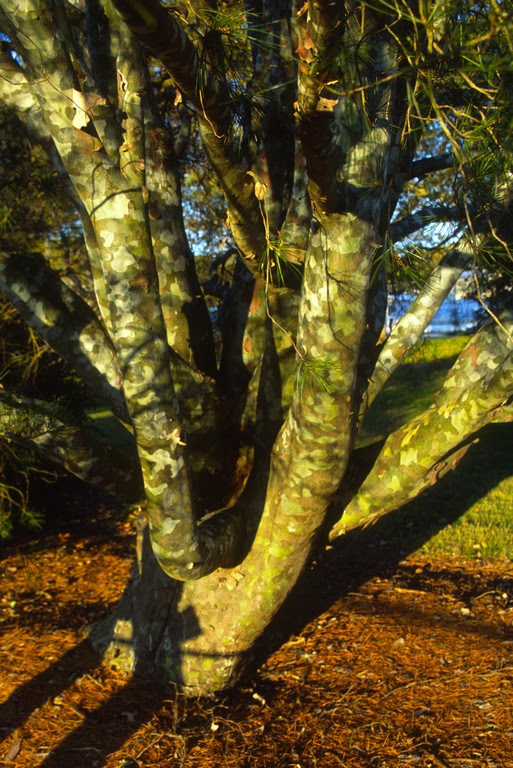 I suspect that it is the cultivar grown in the largest number – whether by rooted cuttings or by grafting – in the world. 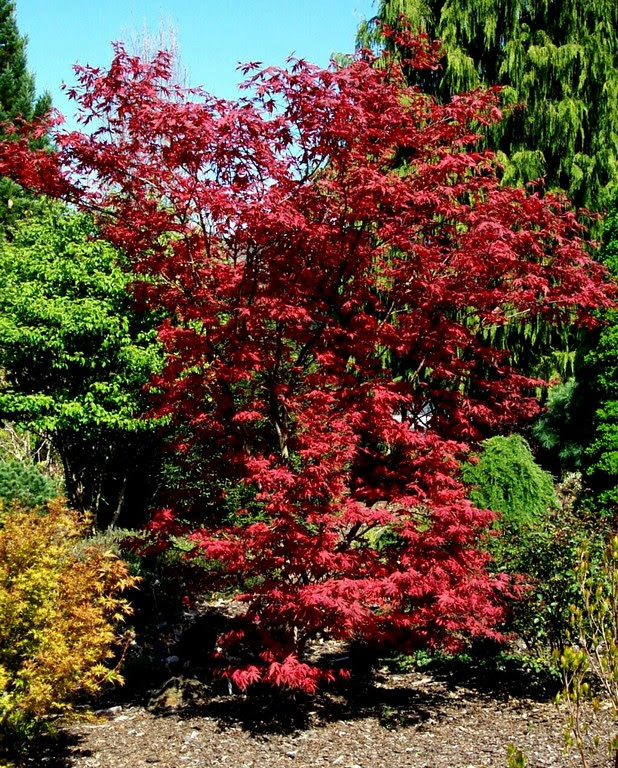 Unfortunately it has become a generic name where its seedling progeny have been offered for sale to me as 'Bloodgood' “at a good price.” I declined as any seedling – even if dark red with 'Bloodgood' as the mother tree – still is not a true 'Bloodgood'. 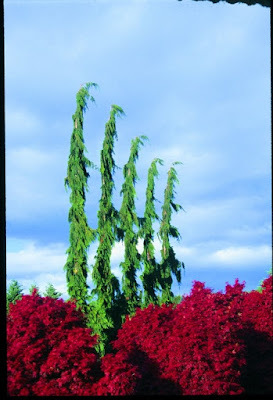 The 'Bloodgood' above was the first I acquired – from a reputable source and originally from Holland. It grew near the office and displayed a particularly attractive canopy. A wheeler-dealer middle-man from Oregon saw it and wanted to buy it. “It's not for sale,” I said. “For $500 he countered?” “Ok sold.” The only problem was that it was April 25th and the tree was already in leaf. The buyer said he had experience digging trees in leaf, and that it should be ok if the rootball was sufficiently large. So with the money up-front we dug the tree, and apparently it did survive. I could afford to part with it because I had developed enough propagation stock from it, and sort of like with loaves and fishes I could still supply my multitude of customers with one-year-grafts. At one point, when we were America's preferred source of maple liners, we produced over 20,000 per year...all offspring from the one original tree. 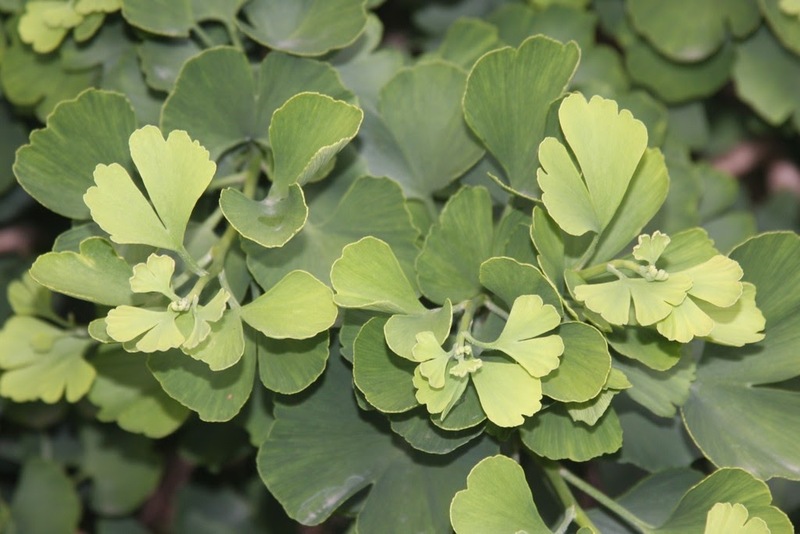 In the stead of the harvested 'Bloodgood' I planted a Ginkgo biloba 'Jade Butterflies'. 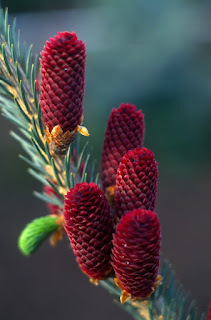 Most consider it to be dwarf, but mine grew into a vigorous dense cone to about 16' tall. I didn't want to sell it because of its fantastic shape, but it was sandwiched between two fast-growing upright maples. 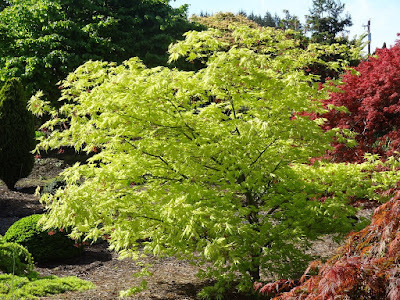 Eventually the two maples – Acer palmatum 'Umegae' and 'Sherwood Flame' will co-mingle, but I may or may not be around to see it. 'Jade Butterflies' is described by Hillier in his Manual of Trees and Shrubs (2014) as “A slow-growing, dwarf, male cultivar, with dense, small, dark green leaves said to resemble butterfly wings.” Commas [sic] Hillier. It's funny because one of my past customers for 'Jade Butterflies' described the leaves in his catalog as being unusually large. The explanation is that he was buying our vigorous 3-year-old grafts that were housed in a greenhouse with lots of water and fertilizer, and indeed the leaves were large. The Hillier description of small leaves is correct; and beware of blind men describing an elephant. I didn't correct my customer because he knew that he was smarter than me – the “Oh well: win some, lose some” guy from a previous blog. 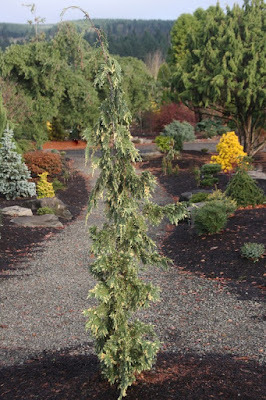 Picea engelmannii 'Snake' is aptly named and a most bizarre tree. As with the “weeping giant redwood” no two are alike. I once had one grow to 12' tall (in 6 years) with absolutely no side branching, and naturally a customer for the unusual had to buy it. Often 'Snake' can be unattractive as the narrow branches flop about, and too often the terminal bud will abort so you're left with a long dead stem after a few years. It is not really profitable for nursery production because if you cut off a terminal shoot for scionwood no side branching develops, and again you have a dead stem. If a tree does occasionally shape up nicely, however, it is a cinch to sell. 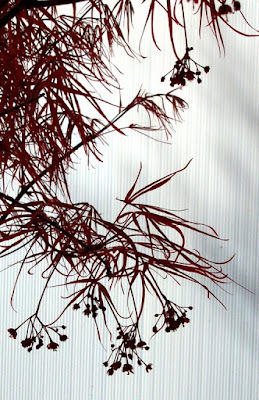 Out of a couple of hundred that I have grown, one tree in particular grew into a full well-proportioned shape, yet with the wild snakes twisting out and we named it “Medusa.” We dug the tree and landscaped I nicely in our booth at the Farwest Nursery Show in Portland, Oregon (about 15 years ago when the show was still valid). No single tree before or since at the 40-year-old show was as unique or drew more attention than our Medusa. Plant people from all over America were amazed that such a thing could exist. Buchholz Nursery deserved no credit for it of course; it was nature herself that produced the specimen...and it just happened to appear at Buchholz Nursery. Ultimately it was sold, and I can't elaborate further because I can't remember who bought it. 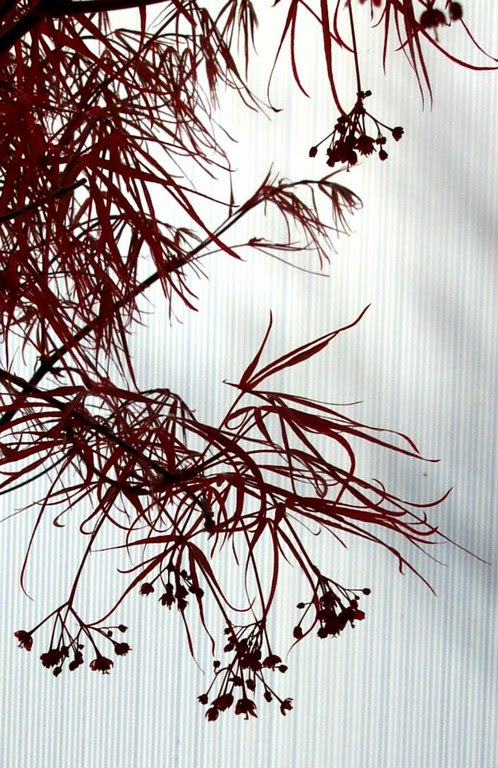 Acer palmatum 'Fairy Hair' was discovered at Buchholz Nursery 35 years ago in a seed flat with A. p. 'Scolopendrifolium' as the seed mother. It survived in the flat with about 100 other germinants because it was located in the corner where it could get some light. If it had germinated in the middle it would have been overwhelmed by its rivals. Interestingly, in the opposite corner of the same flat was a seedling with red linearlobum foliage, and that eventually became 'Red Cloud'. 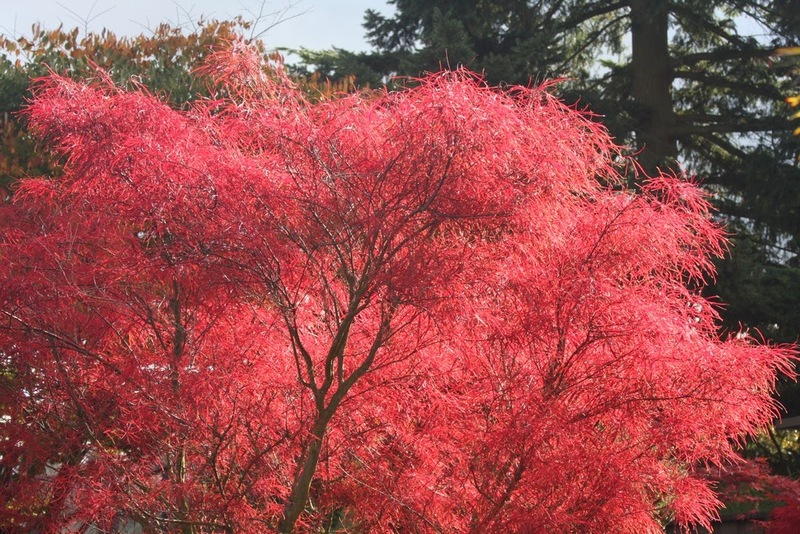 I was amazed that both trees survived the pot-up process as they appeared very delicate. The first chance was taken to propagate from the originals, and after 10 years we had both cultivars for sale. 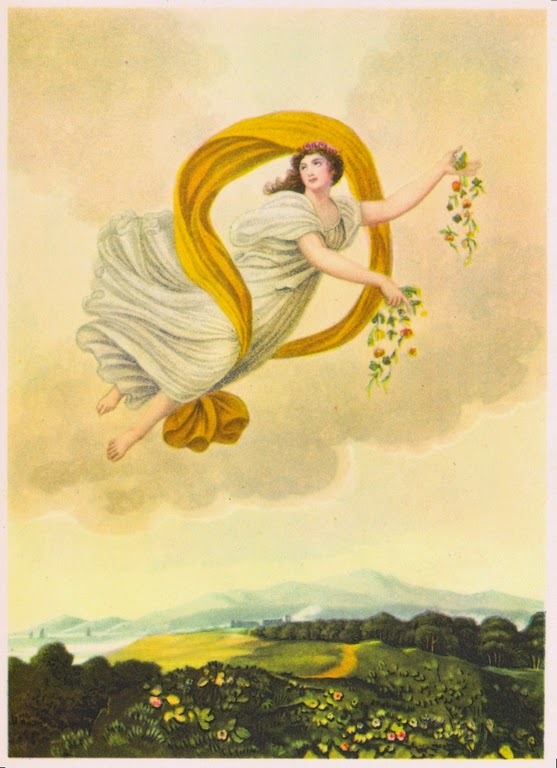 I don't remember who bought the original 'Red Cloud', and I didn't really care because its offspring – on vigorous green rootstock – outgrew the original. I kept the first 'Fairy Hair' however, and it was placed for years in GH19 along with the first two propagules from it. As to be expected, the offspring were at one time about 4 times the size as the mother tree. Actually the mother was more of a “bush” than a “tree,” being about 5' tall and 6' wide, but it had an interesting contorted trunk. 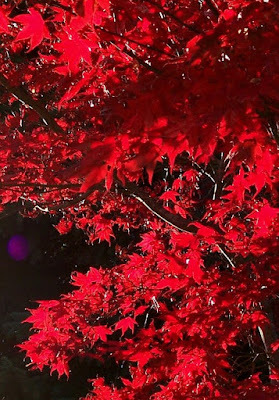 About 10 years ago a maple hobbyist – Sal R. from New Jersey, a retired hockey player who owned an Audi dealership – fell in love with the mother 'Fairy Hair', which the day before I never thought I would ever sell. I was amused by the sight of a smash-bang hockey player so enamoured with the delicate plant that I agreed to sell it to him. I could see that he would appreciate it so much. 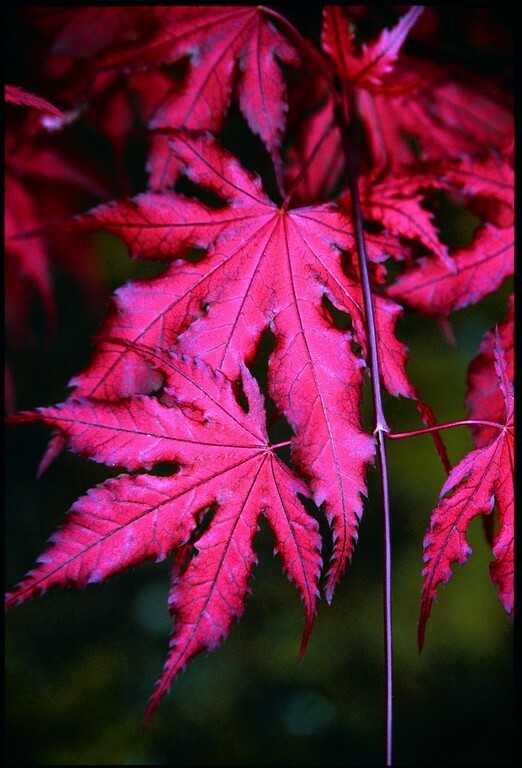 You see: deep down I am really a softy, and I just want to make people happy, especially maple enthusiasts. 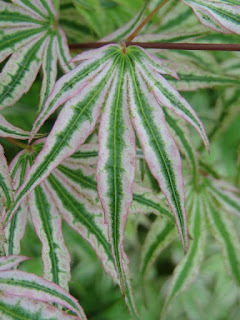 Things didn't work out so well for another Buchholz Nursery discovery and introduction – Acer palmatum 'Sister Ghost'. I mean we grow lots of them now and they sell well, but the original tree was “never” for sale...but I sold it anyway. 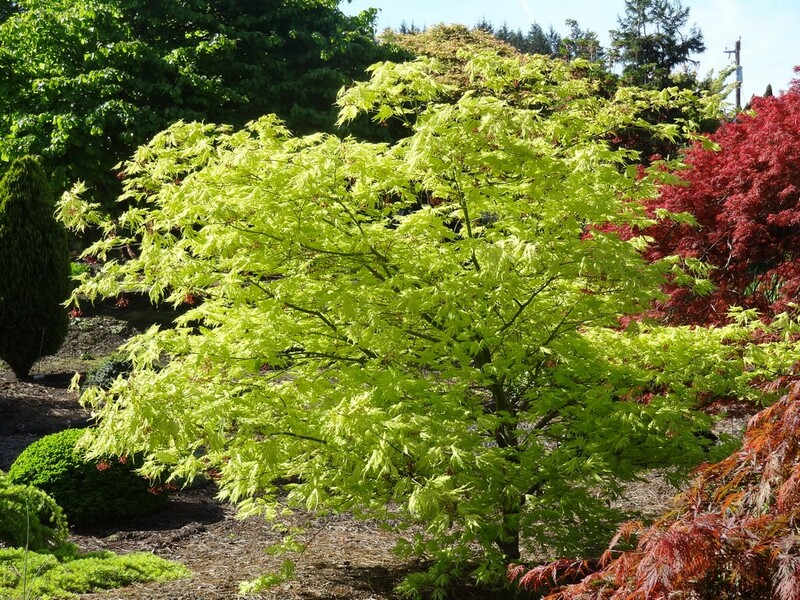 It was a beautiful specimen, and in its glory one spring day a customer of a few years – the boys from Garden of Eden Nursery from Puyallup, Washington – fell in love with the original during their visit. I need cash to operate, and they were so enthused by the tree that I relented and sold it, and at a low price besides. Again, I just want to see people happy. Our terms were 30 days, but after 45 days and no payment I grew worried. To make a long (2-year) story short, I received partial payments every month and then they stopped altogether, with about $4,000 short of their $8,000 total order. Even though they paid for half of their 200-tree order, in my mind one of the trees they didn't pay for was the original 'Sister Ghost'. I don't know if they still have my tree or if they sold it, but they will never be forgiven. For me it's personal. Wisely, however, I will never stop in to “visit” them as things could get ugly. Pinus bungeana was the Holy Grail of conifers, at least in Oregon when I began my nursery 37 years ago. It could be grafted onto Pinus strobus as rootstock – a 3-needle onto a 5-needle – but often the union is not sound. After tossing out a number of yellow-and-dying rejects I lined out about 25 healthy, green trees into the Far East section, and I deemed them to be my piggy bank, the trees that would prosper and finance my children's college educations. Many times customers would request to buy one or all, but I refused...waiting for the big payday. I was smug because no one else on the west coast had any large trees for sale. In the meantime I used these trees as scion stock and sold a couple thousand one-year grafts. 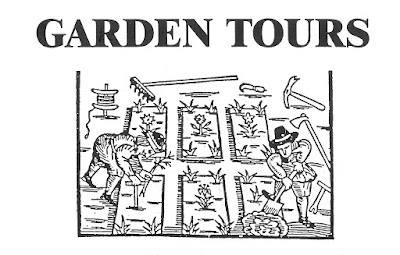 So, Buchholz was one clever nurseryman, right? Ah, well...one winter we experienced a severe ice storm and I discovered how brittle the Chinese species' branches can be. I decided to break the bank: we dug the trees and put them into expensive wooden boxes, then we pruned the damaged branches which thinned out the canopies considerably. I began to sell them one at a time...up to three for one customer. They actually recovered from the ice beating and the following year my price increased. 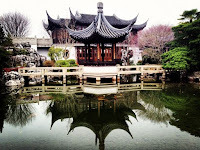 When I had only one left the price was double from the beginning and it was purchased by the new Chinese Garden in Portland. Now I only grow cultivars of P. bungeana such as 'Silver Ghost' and some of the dwarves and our compact selection 'Temple Gem', and now I sell them all at smaller sizes. 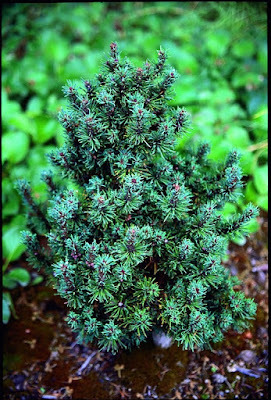 Picea likiangensis is a vigorous Chinese species and I saw it first-hand near Lijiang, Yunnan. 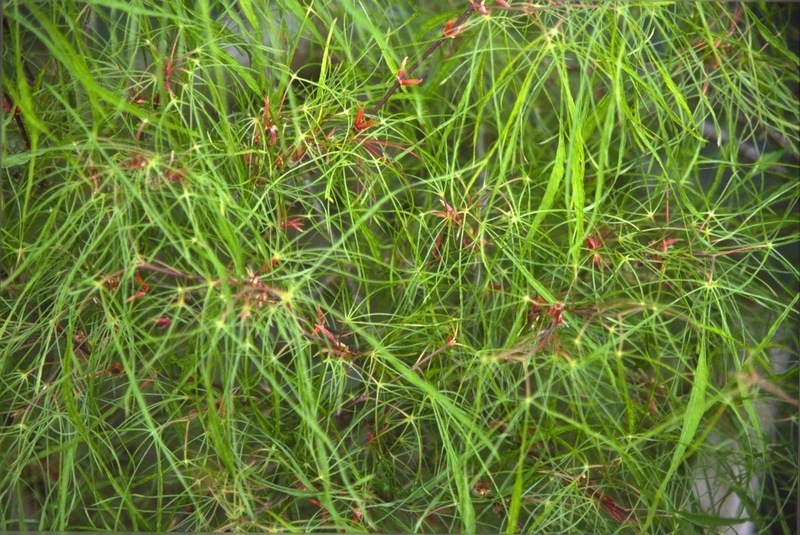 Though it varies in the wild, the form I saw was neat and conical with short blue-green needles. Its main ornamental attribute in my opinion are the beautiful red cones which can appear on young trees. Indeed, one of the tricks of horticulture is to field-plant likiangensis, then winter harvest at 4-6' tall. The shock of digging will compel them to produce cones at the garden center the following spring, and no one can resist it then. Unfortunately it is only hardy to USDA zone 6 and most of my market is in colder areas, and a second problem is that no one can pronounce or remember its name. I discontinued it eventually because I could just as easily produce hardy spruce where sales were strong. One winter my one old specimen blew over in a windstorm, but I didn't propagate from it because I could suffice with a couple of one-gallon pots in the container area, so it was still on the Ark. But wrong it turns out – 20 years later I still can't find those trees. As with a couple of women in my life, my affair with P. likiangensis has evolved into a bittersweet memory. 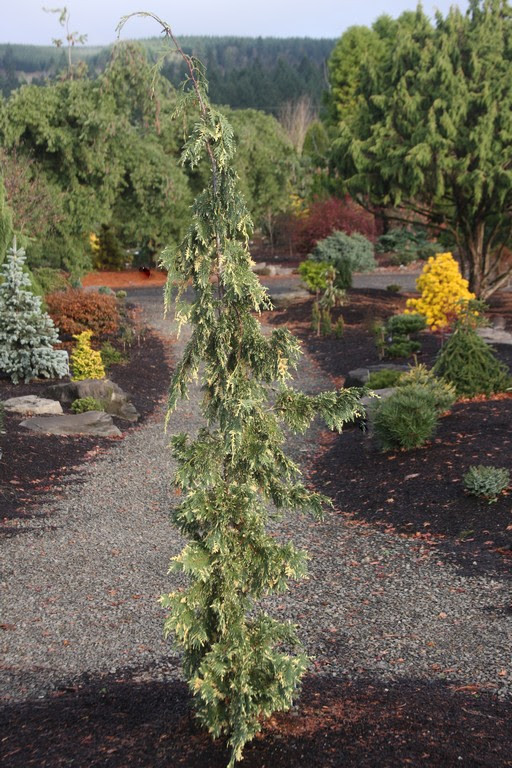 Another plant that “left” the nursery was Cryptomeria japonica 'Ryoku gyoku', a miniature selection made by the late Edsal Wood of Oregon, found as a witch's broom on C. j. 'Tansu'. 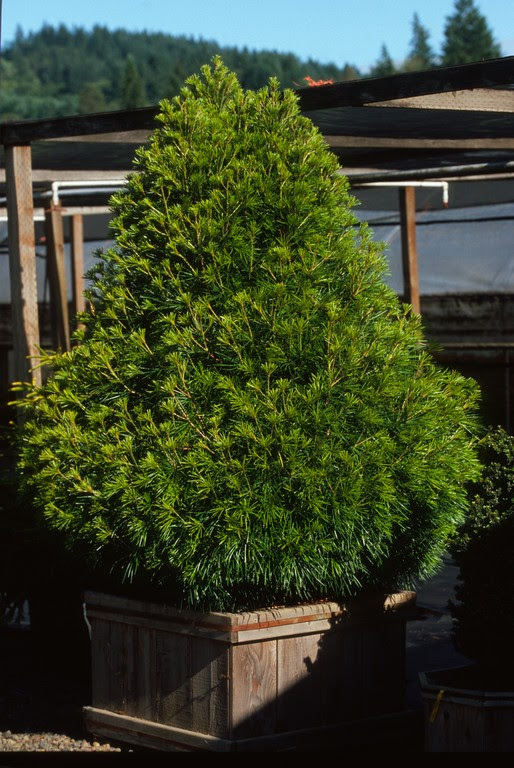 The cultivar is usually mispelled – even the American Conifer Society has it incorrectly listed – but the name translates as “green (jade) ball.” I got my start from Mr. Wood about 20 years ago, and it is now about 14” tall by 18” wide – not really a “ball,” but a flattened globe. When I say that it “left” the nursery, I don't mean that I sold it because it's still here. 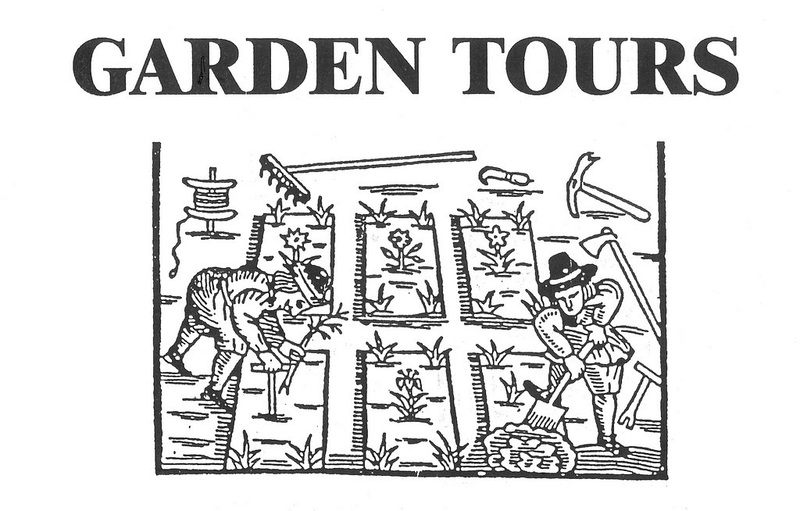 I had a group of about 20 horticulture students visiting our Display Garden years ago. As they were milling about I saw from a distance an older woman reach down and pinch off a portion of my 'Ryoku gyoku' and put it in her coat pocket. I went to the little bush and I verified the theft, and later I stood next to her and I could see the piece poking from her pocket. The Administrator of the horticulture department was leading the tour, and since she was a friend I didn't want to make a scene and embarrass her, and I never did tell her about it. That was about 20 years ago, and what's funny is that the culprit hag went on to start a nursery, and she actually buys liners from us now. She doesn't like me at all, she just wants our plants, and she's always sour because she must pay up front. 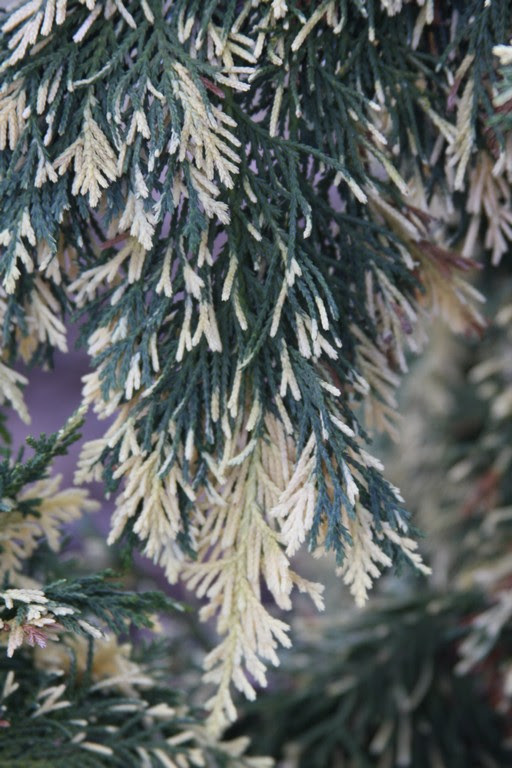 I participated on a tour of gardens in Europe with the American Conifer Society. We were given the following as encouragement to behave. Under no circumstances should cuttings, seedlings or seeds be taken from any nursery or garden visited, without prior consent of the owner(s). To curse the hand that cuttings took. His little plot of ground infest. Plants have come and gone in my life and it has been an interesting and challenging journey. I chose this career so I shouldn't complain about anything, but I often wonder what my relationship with trees would be like if commerce was not attached to it. Less intense, certainly. 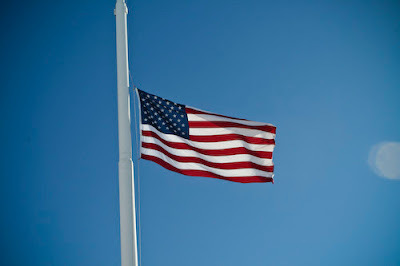 My daughter and I drove through Forest Grove on September 11 and she knew why the American flag at the entrance of town was at half mast. She's only 11 years old, but nevertheless her previous school's teachers discussed the events. That school is located in the almost non-existent town of Dilley (really), just a mile south of Forest Grove, and it is considered one of the top public grade schools in Oregon. Now she attends (6th grade) in Forest Grove at a horribly mediocre school where she has to dumb down to fit in. S. made the observation that the Dilley school discussed the 9/11 events but that Forest Grove made no mention of it, and I understand the reason is the administration worried that it would be portraying Muslims as bad people. 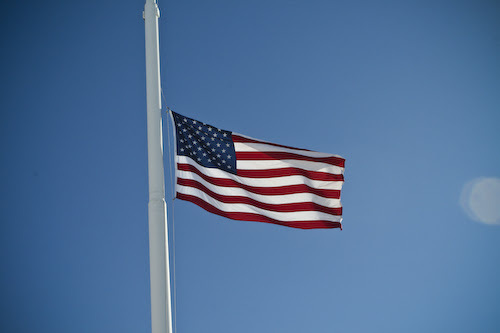 Today most Americans love the Japanese in spite of the fierce and brutal fighting that took place in the 1940's. Should schools skip teaching about World War II so as not to offend a touchy Nihonjin? I was recently given an op-ed article that appeared in the 8/5/2017 New York Times, known to some as the Failing New York Times. It was entitled The Tree That Survived Hiroshima and was written by Ariel Dorfman, an emeritus professor of literature at Duke University. 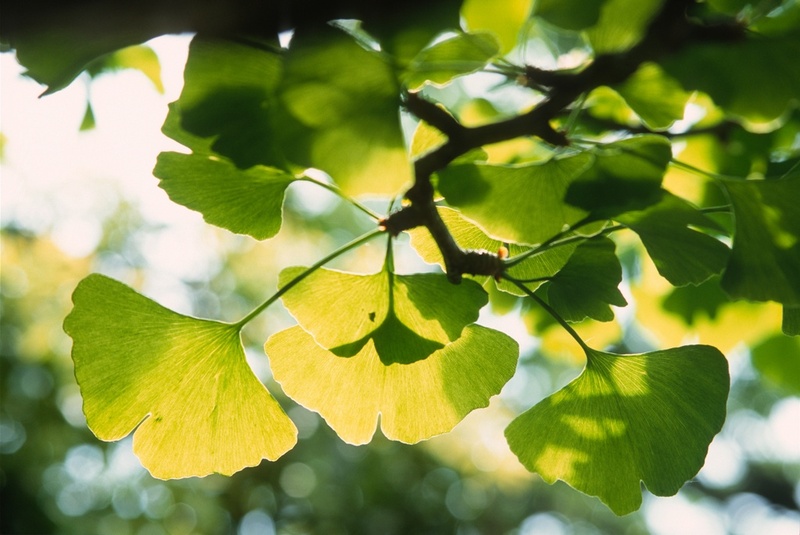 The tree(s) in question are the "hibakujumoku" ginkgos, which translates as "atomic bomb survivors." 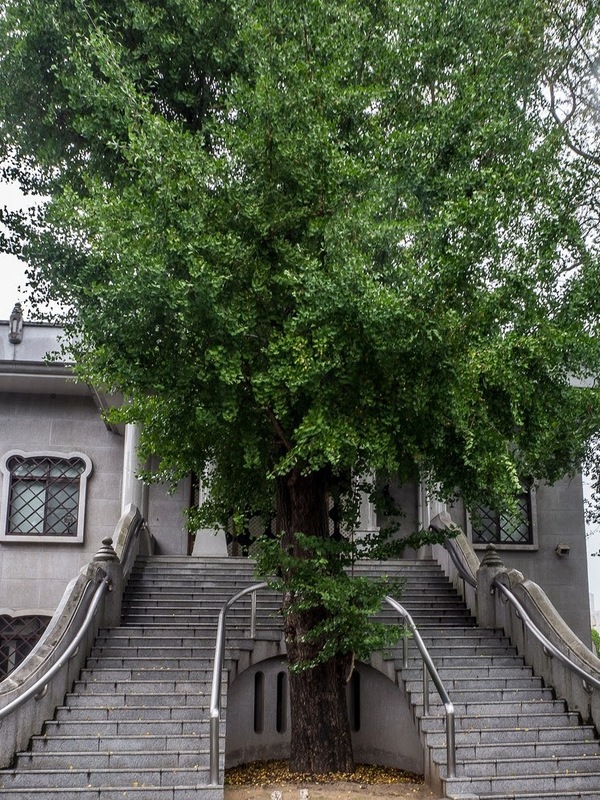 In 1984 Dorfman visited the Hiroshima Peace Memorial Museum and three of the nearby ginkgos, and then-Director Akihiro Takahashi – who had a flattened ear and gnarled fingers from the blast – declared that the ginkgos "expressed the endurance of hope, the need for peace and reconciliation." Dorfman (age 75) is a Chilean-American novelist and human rights activist and he is naturally worried about how dumb and self-defeating humans can be. He concludes his article with the warning, "How paradoxical, how sad, how stupid it would be if, more than seven decades after Hiroshima opened the door to the possible suicide of humanity, we did not understand that warning from the past, that call to the future, what the gentle leaves of the ginkgo trees are still trying to tell us." The Hiroshima Memorial Park was built on an open field that was created by the explosion. I have not visited the park but a structure – now called the A-Bomb Dome – partially withstood the blast and has been designated a UNESCO World Heritage Site. * The "Little Boy" bomb actually detonated over the city and the building and its vertical columns were able to resist the vertical downward force of the blast. Everyone inside the building was killed instantly, however. *The Chinese delegates opposed the designation because it could be used to downplay the fact that Chinese people suffered even greater losses due to Japanese aggression during the war. Tsutomu Yamaguchi (1916-2010) was visiting Hiroshima on August 6, 1945 on business for his employer Mitsubishi Heavy Industries when the bomb exploded. Though injured he returned to his home city of Nagasaki, and the following day he reported to work. 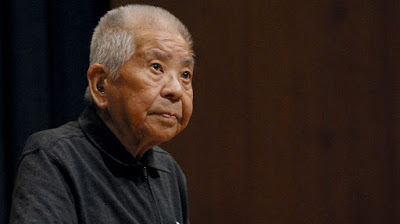 That morning he told his supervisor how one bomb had destroyed all of Hiroshima, to which his supervisor told him that he was crazy, but at that very moment the Nagasaki bomb detonated. Yamaguchi was the only known survivor of both attacks, and he lived to the age of 93 and died of stomach cancer. Yamaguchi was well known in Japan and was naturally a proponent of nuclear disarmament. 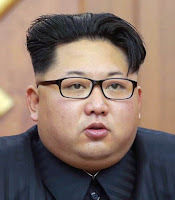 He told an interviewer "The reason that I hate the atomic bomb is because of what it does to the dignity of human beings. I can't understand why the world cannot understand the agony of the nuclear bombs. How can they keep developing these weapons?" 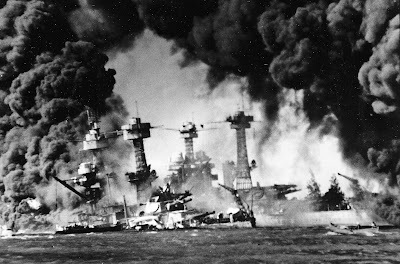 The answer might be because of what happened at Pearl Harbor. On a happier note my wife and kids have been to Hiroshima's Itsukushima Shrine (Shinto) which is also a World Heritage Site. The torii gate was designed and built centuries ago on pier-like structures over the bay so that it would appear to be floating on water. The gate is constructed from decay-resistant camphor wood (Cinnamomum camphora) known in Japan as kusunoki. Though tourists can reach the gate at low tide, its purity is so important that since 1878 no deaths or births have been permitted near it. Therefore pregnant women, the terminally ill and the very elderly are requested to stay away. Hiroshima's name means "broad island" and it is situated on the Ota River Delta facing the so-called Inland Sea to its south. 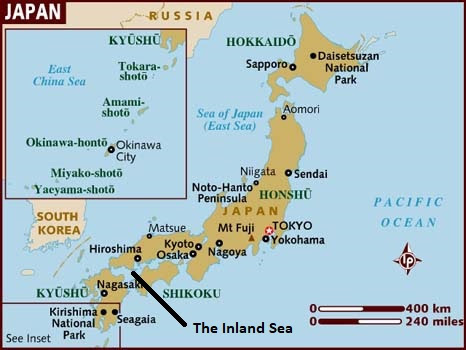 The Sea is created by the area north of the islands of Kyushu and Shikoku and South of Honshu. 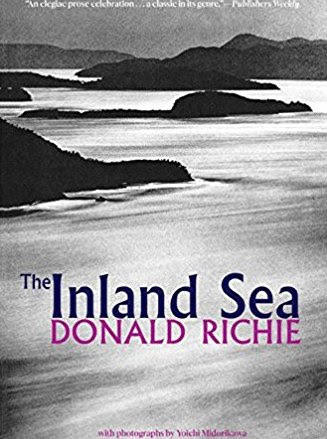 I've never been near the Inland Sea but I feel that I know something about it from reading a travel book The Inland Sea by Donald Richie. The Times Literary Supplement praises the book with, "Earns its place on the very short shelf of books on Japan that are of permanent value." My wife is the perfect Japanese tour guide and hopefully I can visit one day. 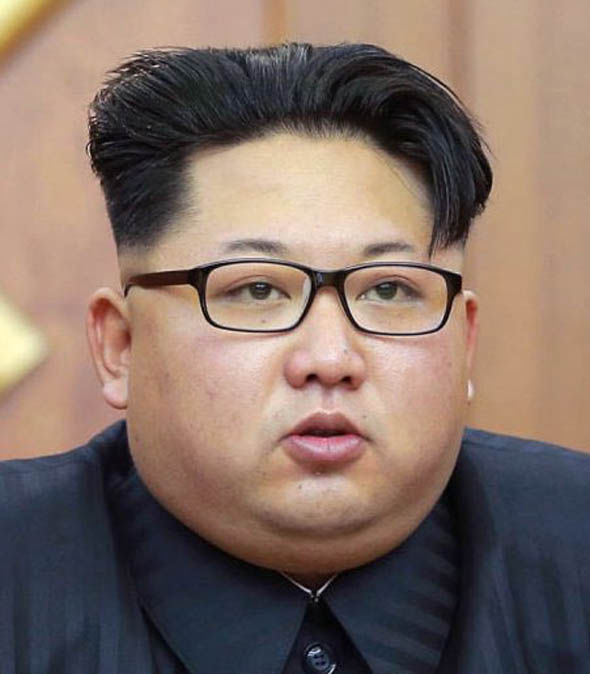 "Don't you dare, Kim Jong-un!"